Yesterday WordPress version 2.3.2 was released, chiefly to fix a bug that allowed any visitor to your site to view any posts set to be published in the future (a request like http://pressedwords.com/?x=wp-admin/&paged=1 would do it). 2.3.2 includes a new feature: you can have a custom database error message page. 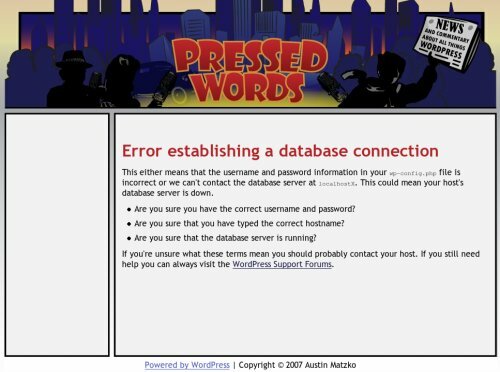 Hopefully many sites will take advantage of this, so when they get slashdotted or dugg and their database servers go down, their visitors won’t blame WordPress (the default error page features the WordPress logo prominently). Save the HTML from one of your posts, perhaps by viewing the source of the page in your browser and saving it. Or you can use wget. Edit the saved file to remove extra stuff such as links to previous and next posts, the sidebar, and the comments section. Rename the file to db-error.php. Upload db-error.php to the /wp-content/ directory. Upgrading WordPress from version 2.3.1 should be painless, as there were no changes to the database structure. Download the latest version of WordPress here. Posted in Releases | Tagged Version 2.3.2 | Bookmark the permalink. Follow any comments here with the RSS feed for this post. Post a comment or leave a trackback: Trackback URL.